Take A 360 Tour And Experience De Luxe Like Never Before! 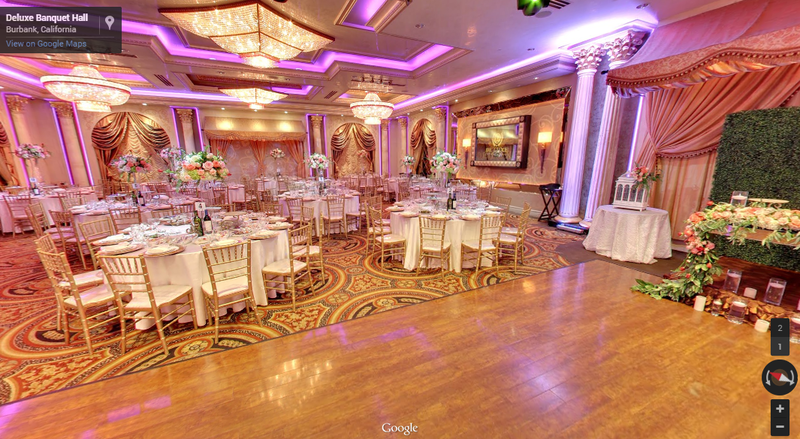 Experience The Magnificence of De Luxe’s Ballroom Through Our New 360 Virtual Tour! The future is here! Now, customers can explore every inch of their local restaurants, banquet halls, bars, or event venues in vibrant high-definition from the comfort of their own homes! Using Google Maps Business View Virtual Tours (an extension of Google’s Streetview), state-of-the-art technology allows curious consumers to take an interactive, 360 Tour of participating local businesses. To stay on the cutting-edge of technology and to give our customers a one-of-a-kind experience indicative of the service they can expect at our event venue, De Luxe Banquet Hall now offers this stunningly realistic tour for both the De Luxe Ballroom and the De Luxe Lounge. After perusing through our collection of high-quality photographs, click your way through our elegant foyer and into our impressively decorated Ballroom, or explore the retro-chic decor of our Lounge without leaving your desk. Take a Virtual 360 Tour now, and see why De Luxe Banquet Hall is the first choice for wedding venues and event halls in Los Angeles!